Sweat is produced by two types of glands that reside just below the surface of this skin: eccrine and apocrine. Though everyone is born with eccrine glands, apocrine glands appear during puberty. Apocrine glands are found in specific parts of the body with a high concentration in the underarm (or axilla) and are responsible for much of the odor associated with sweating. Overactive eccrine glands combined with the activity of apocrine glands contribute to excessive sweating, especially in all of the places you’d prefer they not—the palms, the soles and the underarms. Let’s face it, we all sweat, but some people sweat a little more. 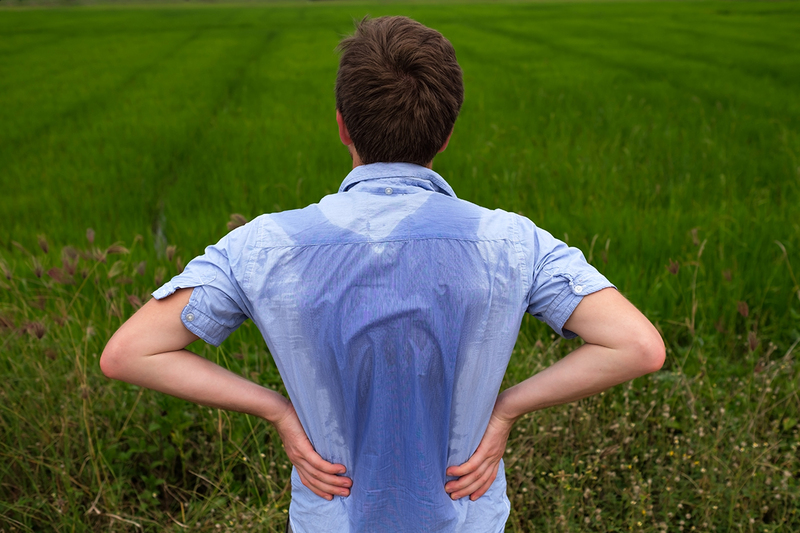 This excessive sweating may be a condition known as hyperhidrosis. A common condition that impacts roughly 7.8 million Americans, hyperhidrosis is excessive sweating in one or multiple parts of the body as the result of overactive nerves. There are two types: primary focal hyperhidrosis and secondary generalized hyperhidrosis. Secondary generalized hyperhidrosis: As the first definition would lead you to believe, this type of hyperhidrosis is the result of another underlying condition or due to medication. It is systemic, meaning it affects the body as a whole and is not confined to specific areas. To help get sweat under control, here are some tips patients of all ages can try to help stay dry. 1. Consider your topical choices. Naturally, the first item that comes to mind when you think of sweat is deodorant. However, you need to read carefully when you’re choosing the right product—does it just say “deodorant” or “antiperspirant and deodorant”? The latter is the one you need. That way, you can smell good and stop sweat. In addition, deodorant antiperspirants may also help you tame extra sweat on other areas of the body (not just your underarms), such as the bottoms of your feet (plantar hyperhidrosis). Along with antiperspirant deodorant, there are creams, lotions and powders you can try to stop sweat with as well. If over-the-counter (OTC) antiperspirant deodorants aren’t quite cutting it, you can speak to a physician about prescription options. These items usually have higher concentration of the substances that block the sweat glands (e.g., aluminum salts), so they tend to have a little more stopping power. 3. Keep sweat stains away (or at least from being noticeable). If your excessive sweating happens with your underarms, you may want to consider purchasing sweat-proof undergarments. There are a number of them available for purchase—they are made with special materials that trap sweat and stop it from soaking through your shirt. However, if that isn’t an option, you can wear loose or dark clothing that won’t expose sweat. You can also buy clothing made of breathable material (e.g., cotton) that may help keep the sweat away. 4. Take the leap—talk to a specialist about what you can do. It may be after all the OTC products, home remedies and advice from well-meaning members of the internet, you still find yourself unhappy and unwilling to participate in social activities because of your excessive sweating. If that’s true, you may want explore additional treatment options for your issue, such as miraDry®, iontophoresis or endoscopic thoracic sympathectomy (ETS). miraDry®: An FDA-cleared treatment to permanently reduce sweat and odor in the underarms. Patients typically experience more than 82% sweat reduction in just one in-office treatment. Iontophoresis: A process that uses an electric current to penetrate and deliver molecules through the skin. This delivery method allows ionized water to permeate the soft tissue to temporarily block the sweat glands. Endoscopic Thoracic Sympathectomy (ETS): A minimally invasive procedure that interrupts the sympathetic nerve chain located in the thoracic (chest) cavity in order to reduce the amount of nerve stimulation that causes excessive sweating, primarily in the hands. No matter how exasperated you may feel, know that there are people who understand how you feel and there are ways to improve your sweating situation. If you’re ready to take the next step and speak to a specialist about how to treat your excessive sweating, contact us today.